Symmons Plains Raceway – the heart of Tasmanian circuit racing, and a scene of many V8 Supercar memories, was the location for the Rally Tasmania shakedown stage, but the initial thought of a rally stage there was puzzling. What seemed to us like the use of the racetrack turned to access roads, and a great media day at that. RallySport Magazine were lucky enough to sit alongside Skoda driver, Adrian Coppin, for one of his runs, and were subsequently excited to see what the fuss was about the R5 cars. My first question to the man I’d entrusted this morning was regarding this impressive R5 machine, and what stood out. 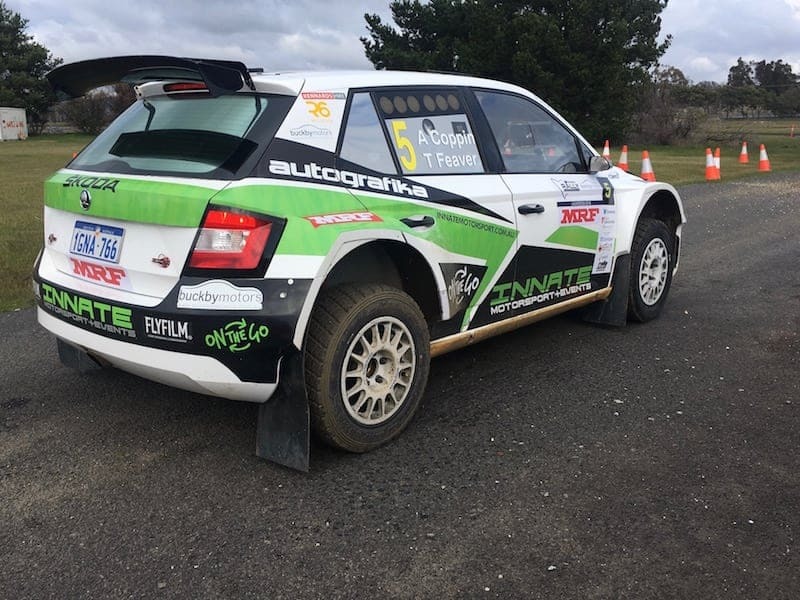 The Innate Motorsports Skoda Fabia R5. Pulling up to the line, Coppin flicked switches, pressed buttons foreign to me, and ‘clunked’ it into first gear. Unfortunately, there was no intercom in my helmet, so mid-stage chat was not an option. I bid farewell to our communication for the next few minutes, and told him to ‘give it heaps’. As the revs rose, the seat vibrated, and though I was strapped in tight, I pulled again on my belts. Coppin relished in the front-wheel-drive ARC era, and 2018 marked his return to the championship. First in a Peugeot 208 AP4, and then a Skoda Fabia R5. His driving has been fast and consistent and has graced the podium in both Canberra and Tasmania, and he’s quick to credit the car. “It’s no doubt the greatest car I’ve ever driven,” he said in Perth earlier in the year. The way it turns, stops, and squabbles for grip on the looser surface is a unique feeling. Control in the car it seems, is easy to come by, and the research and development is obvious. “Simply in the way it works and how efficient it is, you can tell where the the money has been spent,” he said. Sliding on the loose surface, he was throwing it in like no other, and despite a near spin, Adrian’s confidence in the car showed what a machine it was. Coppin, Rally Australia’s Sporting and Business Development Manager, liked the way the organisers had set up the media day. “It’s fantastic the way they’ve done the media day here,” he commended. “Often you’re stuck in the middle of the forest, and to have it here brings a bit more glamour to it. Coppin would know a thing or two about test stages, as his company, Innate Motorsport and Events, run several test days for top rally teams, and have lengthy experience in the area. 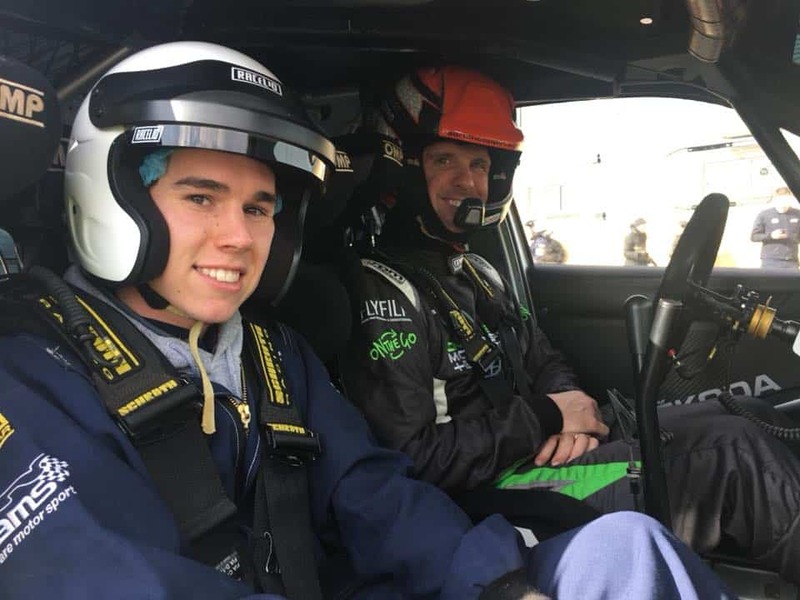 Though Coppin’s 2018 season has come to a close, he is adamant of a return to the stages full-time in 2019 as he begins talks with sponsors for another assault at the Australian Rally Championship. “We’re currently in talks for next season with several sponsors,” he said. 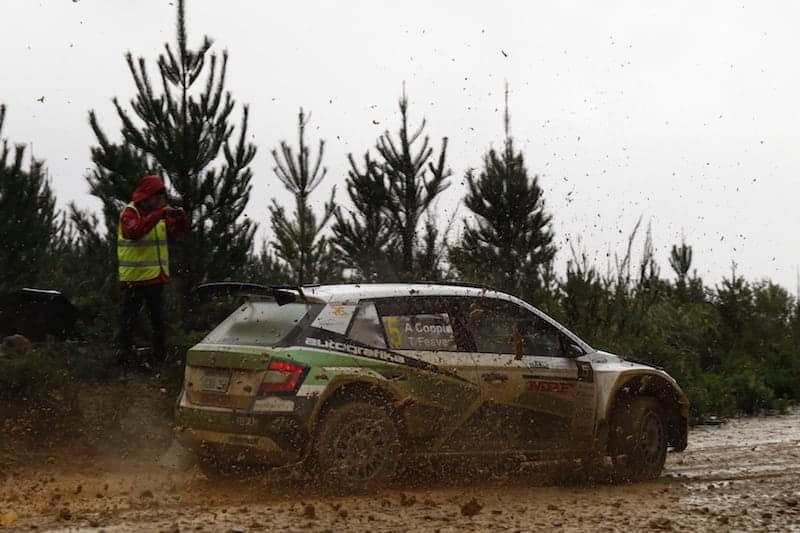 RSM’s Luke Whitten on-board with Skoda driver, Adrian Coppin. The Skoda had mastered the slippy conditions, and was quickly moved back in line for another lucky guest. Though I’d ridden in a couple of impressive cars in the past, this was something else. “That’s just gone onto the ever increasing bucket list – competing in an event in an R5 car,” I said to anyone who cared to listen. RallySport Magazine appreciates the support of Innate Motorsport and Events and our other valued supporters. If you’d like to help ensure the future of the website, please donate.